Skate With The Players 11-04-2008 · Let's Go Amerks! 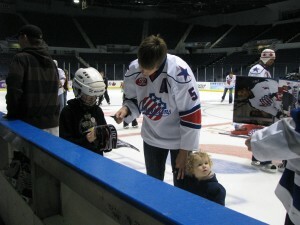 My husband and I took our son to the annual Season Ticket Holder’s Skate with the Players tonight at Blue Cross Arena. Last year I had a lot of fun at this event, but my son was just a little too young and a lot too shy to go with us. 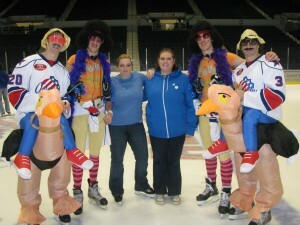 I personally think this is one of the best events the Amerks’ put on throughout the year. From 6:00-7:00 p.m. the veteran players were on the ice. This included Rory Fitzpatrick, Janis Sprukts, Drew Larman, Stefan Meyer, Peter Aston, Tanner Glass, Dan Collins, Kenndal McArdle, Jordan Henry, Doug O’Brien, Chris Beckford-Tseu, Franklin MacDonald, David Brine and Tyler Plante. Karl Stewart was out with the first group. He wasn’t skating because of his knee injury. But, he stayed on the bench the whole time and was pleased to talk with whomever sat down next to him. This was the first tiem I had gotten the chance to talk to Karl and he is a very nice and passionate guy. He said his knee injury is an old one that flares up sometimes and he just needs to rest it and it is fine again. 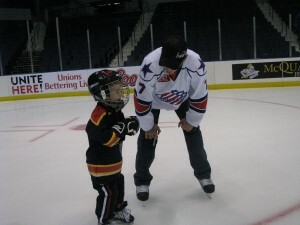 Not even two minutes after we got on the ice, Tyler Plante greeted us and asked Jake (my son) if he wanted to race him. Of course he did, even though his little 4-year-old legs would never keep up with Tyler. Not only did Tyler race him, but he took him around the rink flying along. Jake was in heaven seeing as he wants to be a goalie and thinks Tyler is a great guy…one of his favorites. Shortly after that, Drew Larman came over to take Jake’s hand and skate with him. All the players were off somewhere skating with kids and having conversations with season ticket holders. Even Janis Sprukts and Jason Cipolla brought their kids to partake in the fun of skating on your hockey team’s home ice. Before leaving the ice, Tyler Plante informed me that the rookies would be wearing their halloween costumes on the ice for their shift. The team was having their halloween party at the arena after the skate was over so, the “older” guys decided it would be a blast if the rookies had to go out on the ice with their costumes on. And they were right. The rookies who came out on the ice from 7:00-8:00 p.m. were Mike Caruso, Jason Garrison, Keaton Ellerby, Riley Emmerson, Brady Calla, Luke Beaverson, Andrew Sweetland, Michal Repik, Mike Duco and Shawn Matthias. The best costumes of the night go to Shawn Matthias and Keaton Ellerby for whatever they were (roller skating guys with afros in tights?) 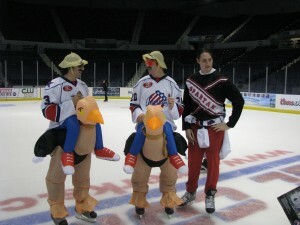 and Jason Garrison and Luke Beaverson who were guys riding on ostriches. They were all having a great time with each other while hanging out with their fans. People always thin out when it’s the rookies’ turn to be out on the ice. That also seemed to be when people step off the ice to enjoy the free pizza and pop. It was a very light crowd this year compared to even last year. One lady seemed to sort of agree that having this on election night wasn’t the smartest choice, sort of like a game on Halloween. It also could have to do with the on ice performance, but either way it was a fun night to hang out and skate on the ice at Blue Cross Arena and not worry about all of that. As we were leaving, Keith asked Lewis Staats about “change we need.” He seemed to understand. He knows, he said Styres knows, and Jack Birch knows we need someone to score. Staats also mentioned that they want to find the right player, not just someone from the ECHL who might score a couple goals. Let’s just hope they don’t take too long. It was so nice to see everyone having a great time just hanging out together. Fans and players. I wish they would do this more than once a year. I know for a fact my son would love to go to another one.